I’m back. Again. With more videos for your viewing pleasure. This time, though, we’re changing things up a bit! As they say in Pokemon, a wild series appeared! It’s…Minecraft. But not just any old Minecraft. 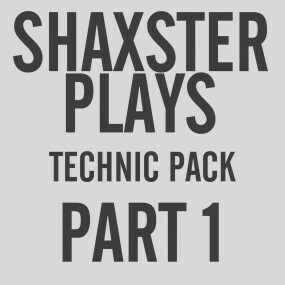 This is the Technic Pack, possibly the best mod collection of all time. And I’m here playing through it. I can promise you, this will be an incredible journey. And it all starts here. Think about it: if you watch this, when it becomes super popular (I have a large ego), you can be all hipster: ‘I liked it before it was cool’. You want to be a hipster, don’t you? Then watch this! And remember, new videos every Wednesday, Friday and Sunday. Nice post. I learn something new and challenging on blogs I stumbleupon every day. It’s always interesting to read articles from other authors and practice something from their sites. I seriously love your website.. Great colors & theme. Did you develop this website yourself? Please reply back as I’m wanting to create my own site and want to learn where you got this from or exactly what the theme is called. Kudos! Thank you for sharing superb informations. Your site is very cool. I am impressed by the details that you¡¦ve on this site. It reveals how nicely you perceive this subject. Bookmarked this website page, will come back for more articles. You, my pal, ROCK! I found simply the info I already searched everywhere and simply could not come across. What an ideal site.